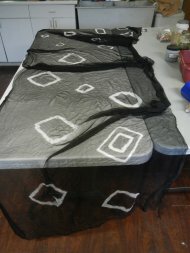 Two types of silk fabric are available here: chiffon and paj - pictured above lower left and upper right, respectively. 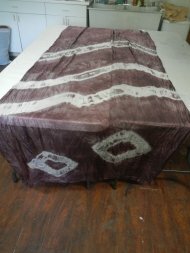 I purchase bolts of both of these in white as 54" width bolts and then I hand dye it here. 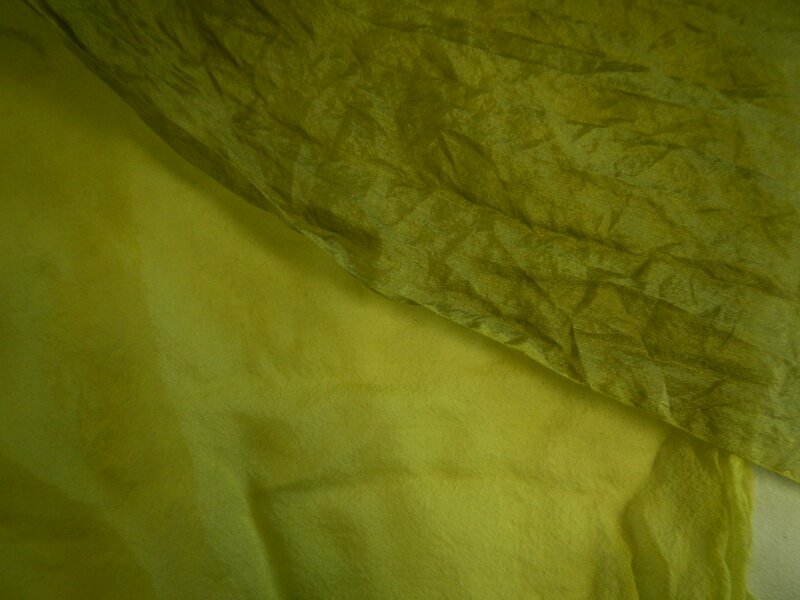 Paj (some call this china silk or habotai) is a bit heavier at 4.5 - 5 mm (depending on what is in stock) and has more sheen than the Chiffon (called gauze by some) which is typically 3mm-4 mm. When I hand-dye, I dye for 4 different effects which I picture and describe below. 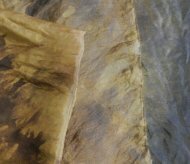 Please note that the nature of hand dyeing is that no two pieces are ever exactly alike. And I don't update photos when I dye new batches because it is, well, too much work. So the photos below give you a close idea of what each colorway I dye looks like, but if you order your piece will not be exactly as that pictured. 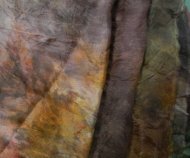 If you want roll-hemmed scarves for nuno felting, check out the irridescent scarves. 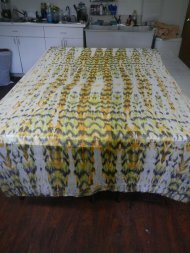 Both the paj and chiffon are 54" wide to start - tho' I notice they lose a bit in the dye process so you might count on them being in the 48-50" width. This is a lot wider than most, so keep that in mind when you are comparing prices here with elsewhere! This is sold by the yard (no halves or quarters, sorry). 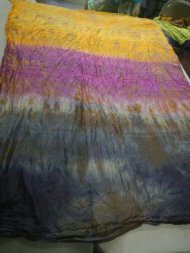 I generally dye the pieces in 6-8 yard lengths, so if you order 10 yards of a color, it will not be from the same dye bath. I dye a lot more colors than you'll see pictured here. I only have time to photograph a few and post them online. If you're interested in a color that you don't see below, you can always call the store and whomever is working can tell you what we have and then if there are a few others you might be interested in we can send you photos of those by email for you to decide on.